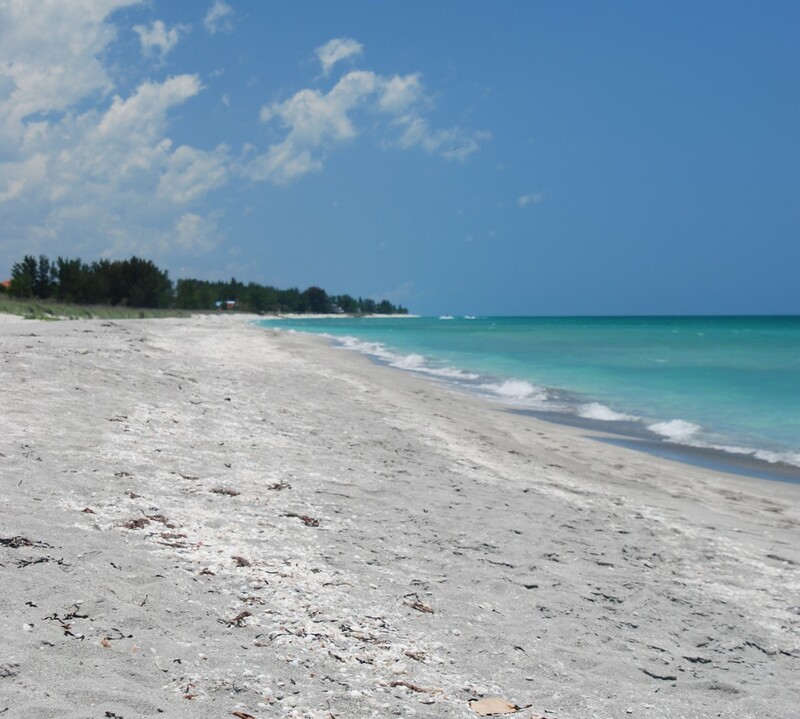 I’ve had a lot of searches on my blog for things to do around Siesta Key this October. Well, sadly I’m not there this October but I can still report what is going on. Here’s the list of all the things I’m going to miss. Hope you can make it to at least some of the events. And write to me…let me know how fun it was. I’ll be back…. There is an open water swim at Siesta Beach on October 3. Go here: http://www.sysharks.org/info/2009tropicalsplashentry2.pdf for information. The Siesta Key Triathlon is October 4. It also benefits the YMCA Sarasota Sharks swim team. There is no race day registration so go here: http://siestakeytriathlon.org/ and sign up. Every Saturday the Ringling Museum has Family fun events. www.ringling.org Check out other events going on there all month long including a ballet night at the Oslo Theatre. October 8 at 8am meet at the gazebo at the Celery Fields for bird watching with the Audubon Society. I love going to the Celery Fields. We have seen the coolest birds there. For info call 335-3119. They’re hoping you’ll give a donation for sharing their expertise with you. It’s well worth it. Calling all Safe Boaters (or those that want to be): The Sarasota Power Squadron is holding Safe Boating classes this month starting October 5th. Call for info: 400-6467. If you want to escape to another island, the St. Armand’s Art Festival is October 10 and 11. http://www.starmandscircleassoc.com/events/ We really like the Columbia Restaurant so stop in there for a salad or cuban sandwich. I have to promote something that benefits the 4H and the Extension office. My kids are 4Hers. So please go to the Sarasota County Master Gardeners Annual Plant Sale on October 10. It’s from 8am to 2pm at Bee Ridge Park. Call for more info: 364-5838. Refreshments are being sold by 4Hers, so buy a plant and a refreshment. Thanks! This same weekend (Saturday only) at GWIZ (my kid’s favorite museum) the Sarasota Magic Club is hosting a magic class for children in grades 4-8. Check out www.gwiz.org for details. Safe Treats, the annual Trick or Treat event on Siesta Key at the Village is on October 31 from 3pm-6pm. It’s a fun, safe kid’s event. Sorry we’ll miss it this year. Other Halloween events: October 24 at GWIZ www.gwiz.org; October 27 at Selby Gardens Little Sprouts Halloween Parade www.selby.org; I’m sure there are so many more that won’t be advertised until closer to the date. No interest in the above? Kayak the Grand Canal, bike from the north end to Turtle Beach and back, explore the shops at the Village, hunt for iguana (the Siesta Key Association will be happy if you find one), bird watch, go fishing, search the sandbar near the public beach for sand dollars before the water gets too cold; comb the beach; grab a chair and sit along the water; call a friend up north from the beach and let them hear the beach sound (they may hop on the next plane for Sarastoa or quit being your friend); rent a boat; parasail; play bocce ball on the beach; eat ice cream at Big Olaf’s; watch the sunset; walk briskly from parking lot beach access 5 to Point of Rocks and back; look for bioluminescent critters after dusk near the shore (stay out of the water after dark…its dangerous); stand on a street corner and call out to everyone that I said hi (you might get some funny looks); shop at Bliss in the Village for Sunshine Everyday tshirts; cookout at one of the public beach pavillion grills; toss the football around on the beach; play paddle ball; build a sand castle/sand sculpture; float in the water on a noodle; pick up trash from the beach; fly a kite. If it’s raining check out my blog about what to do on Siesta Key in the rain. Just enjoy your day at the most beautiful beach I know of. My boys are 4H exhibitors at the County Fair. It was a lot of fun for them to put their projects together and even more fun, it seems, to see their projects on display. They made pillows, clay items, photography, collections of Pokemon cards and Lego, wood burning and shell art. And a bonus is that they won ribbons and money for their efforts. All of their projects are on display with other really talented 4Hers in the 4H Mini Building. Please stop by and see what all the members have done. While you’re there, you can by a raffle ticket for a whole swine at just $2 per ticket. The drawing is this weekend. You can also purchase a clover for $1 that will have your name on it and displayed on the Mini Building door. Proceeds go to the 4H Foundation which provides funding for each of the club’s activities. Many 4H members also have animals and plants on display and for sale. And, when you get hungry, stop by the 4H trailer for an elephant ear or funnel cake and a refreshing drink. The proceeds also go to the clubs. The trailer is located near the Potter Building. The fair starts at 2pm each day and runs through this Sunday, March 23. It is at Robard’s Arena on Fruitville Road. Enjoy yourself at the fair. 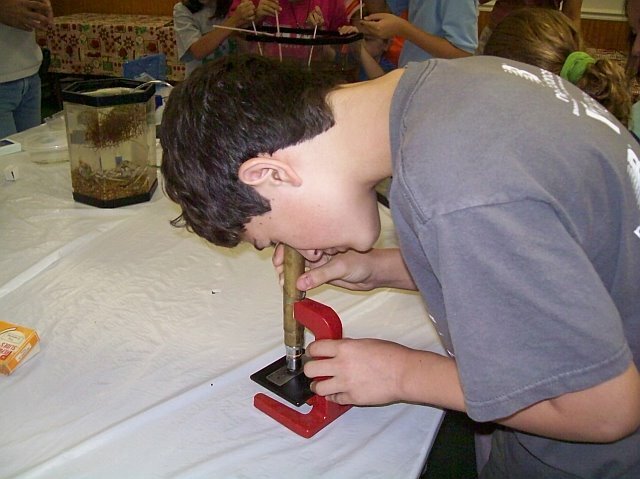 The boys had a microscope workshop today with their 4H group. Keith Wilson, from the Extension office, taught the class. Before looking at the samples he had brought with him (crabs, fish, plankton, seaweed), he gave instruction on how to put together a salt water fish tank. My youngest son helped him with this. First, he set the base and tube into the tank then covered the base with gravel. We learned that you can use crushed shells straight off the beach instead. Add ocean water and wait 3 weeks for bacteria to grow on the rocks or shells before stocking the tank with creatures. If you don’t let bacteria grow before stocking the tank and the creatures will expell waste and the water will turn yellow with ammonia and harmful bacteria. The good bacteria will keep the water balanced for the creatures to live in. Once the gravel was in place, he put in the air filter and turn it on then added critters. 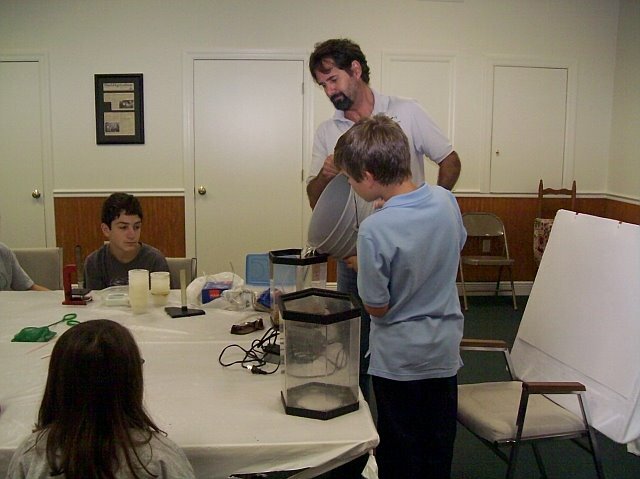 His rocks, bacteria, critters and water had previously been in a tank and had separated them for the class demonstration. Keith also instructed us on salinity levels. When the tank looks like it’s lost water to evaporation, you’re supposed to add distilled water. 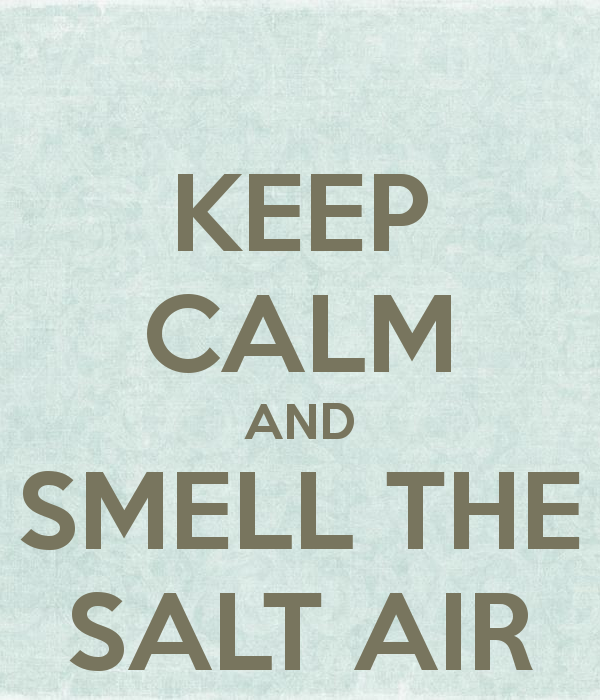 What evaporates is the fresh water, not the salt, so if you add more salt water to the tank, the salinity is raised and most creatures will die. Distilled water will replenish the evaporated water without changing the ph or salinity. Keith gave us a 20 gallon tank to use. We’ll set it up in the house and by the second week of December we’ll invite the 4H club over to net some creatures from the surf. Hopefully club members will be able to come over often and participate in making it a really cool aquarium. Keith suggested swapping out critters often. That’s fine with me. Someone suggested putting a shark in the tank, which would be cool, but I don’t know if I could handle living with a shark for long. Plus, it would outgrow the tank. A baby shark for a week or two…that’s ok. Tune in for more info in December. Remember…Siesta Key has their annual Trick or Treat event in the Village on Friday. It starts at 3pm and ends at 6pm. Apparently all the merchants with balloons by their doors are handing out candy to young ones. Our neighbors are taking their boys to the Siesta Cove neighborhood across Midnight Pass from the Catholic Church. I was told the neighborhood has their own celebration and in previous years the streets have been packed with trick or treaters of all ages. Get up early and drive around for yard/garage/estate sales. They seem to be the thing this time of year. I never get there early enough so I miss out on the “good stuff”. I did pass by one in the spring that was just getting underway on a Friday and got a double-tiered end table for $2. One leg was wobbly so I folded up a match book cover (with out the dangerous stuff attached) and slid it into the gap. It doesn’t wobble any more. I’m proud of that find. Jungle Gardens has a “Creatures of the Night” party on Friday from 6-9pm. Check out their website: www.sarasotajunglegardens.com. Farmers’ Markets: Sarasota on Saturday, Siesta Key on Sunday. Artists’ Market: Starting Nov and running every Saturday through May, this market will be held at the corner of PIneapple Ave and Laurel Street in downtown Sarasota from 10am-4:30pm. If you’re a Florida resident and have proof (like a driver’s license) you can get into Historic Spanish Point FREE this weekend. Call 966-5214 for more info. Feel like driving to Venice? Then try the Art Fest, both Saturday and Sunday from 10am-5pm. Admission is FREE and it’s located in the historic part of town. And, there’s always the beach. We have some friends coming to town for the weekend to celebrate their son’s birthday so we’ll be on the beach Sunday. Happy Birthday, Tomas! Have fun and thanks for reading my blog. Ever notice how once September arrives there is something to do every weekend? Summers in FL, I’ve noticed, are dull if you’re looking for festivals, parties, or special events. Then the weather starts getting perfect and the northern visitors start arriving and then the calendar gets double-full. I’ve noticed this with our school calendar. Of course, lots of things don’t happen during the summer…4-H, boy scouts, Audubon events (of course I still watch for birds). So now that September is here, and today the first day of fall, I thought I’d post some events for the next month. I’ll include the last weekend of September in the mix. A free half-hour practice of T’ai Chi Chih, easy-to-do movement exercise. No experience needed. Mote Marine Laboratory & Aquarium, 1600 Ken Thompson Pkwy. Learn from one of the leading watercolor artists in our area. She was the president of the watercolor society in 2006. 14th Annual Sarasota Craft Festival October 18th and 19th. This Annual Craft Festival takes place at Orange and Main Street in Downtown Sarasota. October 25th from 7pm – 11pm. Take the family to the Pineapple Scare Haunted House hosted by the Sarasota Firefighters Benevolent Fund on the corner of State and Pineapple Streets. I’m sure there’s a lot more to do. But this is what I found. In addition to 4H, homeschool outings and the usual trip to the beach every Saturday and Sunday I know this family will be busy. How about you?